Chocolate industry newcomer Art Pollardbegan selling his chocolate only three years ago, but connoisseurs already place it among the world’s best. You can count Arthur “Art” G. Pollard (BA ’96) and David C. Goble (BS ’96) among the multitudes who believe in life, liberty, and the pursuit of chocolate. But count the software-developers-turned-entrepreneurs out of those who believe all chocolate is created equal. That conviction has sent Pollard around the globe in search of the world’s finest cocoa beans to process in their Orem chocolate factory. The team originally worked together in the software world creating search engine technologies, but chocolate had long been one of Pollard’s interests. Pollard recalls making an offhand comment while at BYU that it would be cool to make his own chocolate. 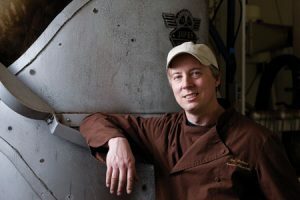 While designing equipment for the physics department, he began work on his own chocolate refiner and started experimenting with high-quality cocoa beans. Years later, Goble tasted Pollard’s chocolate and convinced him it would be a good business venture. But once the decision was made, Pollard was enthusiastic. He flew to Europe to study chocolate manufacturing, visit factories, and purchase equipment for refurbishing to add to their equipment. They called their new company Amano Artisan Chocolate. In Italian amano means both “by hand” and “they love.” “The name describes the care and perfection we bring to chocolate and the people who savor it,” Pollard explains. Created with top-quality beans and old-world technologies, Amano chocolates are 70 percent cocoa and retain “notes” of citrus and red fruit in their flavors, depending on the bean’s source. Although they have been sold only since 2006, Amano products are used by top chefs and Amano bars have repeatedly won awards at artisan chocolate tastings. The company received a gold medal from the London Academy of Chocolate in February, “hugely impressing the judges,” according to the results; it’s the highest award the academy has given an American company for bean-to-bar dark chocolate.